Church leaders give an ultimatum to parents who stand by their homosexual daughter: publicly separate themselves from her, or leave the church. A minister is removed from his position because he has worked with a colleague who holds an unorthodox opinion about the nature of hell. Leaders of another church refuse to participate in a citywide gathering of churches because they consider a participating church to have "unhealthy" beliefs or practices. Believers visiting a church are shunned or mistreated because they are members at a "questionable" congregation. All of those events have happened, some more than once, and most to people I know, in situations of which I have first-hand knowledge. All of them have one thing in common, of course: the assumption of guilt by association. The theory goes this way: if A is guilty of X, and B associates with A, then B is sympathetic toward A and shares in A's guilt. If not, why wouldn't B publicly repudiate A? I, in my zeal to stand against X, must repudiate both A and B; otherwise, I share in their guilt. 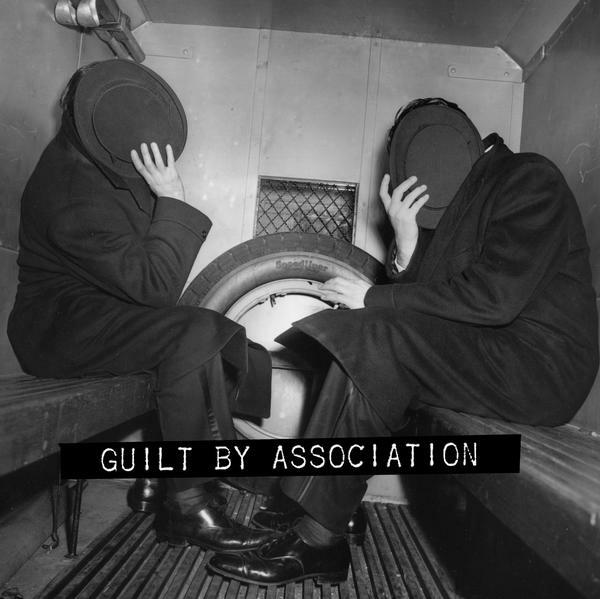 It's fairly convoluted and complicated reasoning, but it operates on one basic assumption: guilt by association. In some ways, it sounds right. Doesn't the Bible say that we must not associate with sinners? Aren't we told to avoid every appearance of evil? Don’t those who welcome false teachers share in their work? Let me be clear: there are situations in which Christians and churches must disassociate from other Christians or churches. Jesus, though he memorably warned his followers against judging others, specifically outlined a procedure by which members of the community of believers who were involved in sin should be brought to repentance or treated as “a pagan or a tax collector.” Paul told the church at Rome to “keep away” from people who were divisive or taught something that didn’t fit with the gospel they had received. He warned the church at Corinth against tolerating blatant immorality, and insisted that they “hand...over to Satan” the guilty person. He went on to tell them not to associate with someone who claims to be a believer but “is sexually immoral or greedy, an idolater or slanderer, a drunkard or swindler.” “Do not even eat with such people,” he finishes. While it should never be done in a spasm of self-righteous anger, and should always be as much about the redemption of the one disciplined as the purity of the church, there are clearly times when churches are called to practice excommunication, or disfellowshipping, or shunning, or discipline, or whatever you’d prefer to call it. This is probably something we aren't very good at in our day. It's questionable how effective it is, anyway, since in our world a person who isn't welcome at one church can just go across town to another. But it's clear, I think, that our culture's emphasis on tolerance and diversity as the highest good, and its aversion to anything that looks like judgment, has influenced us here. We often resist the "nuclear option" of church discipline, even in those situations in which it's likely biblically called for. I think that resistance is not all bad, though. I believe I’d rather be guilty of not disciplining someone who should have been rather than of acting hastily in breaking a relationship with a brother or sister who, it turns out, was innocent. Delay, in this case, gives opportunity for conversation, prayer, and thought. It gives a church the chance to reflect on whether or not their impulse to discipline might be coming from somewhere other than a place of concern for the well-being and health of the church and the individual. It gives the individual a chance to clarify his or her attitude, position, opinion, or practice. If our relationships with one another are to be characterized by humility, patience, and gentleness, if we’re to bear with each other in love, and if we’re to make every effort to keep the unity created by the Holy Spirit by valuing and maintaining peace, then surely we should only exercise the last resort of church discipline after much prayer, conversation, and weeping. Some churches, some Christians, seem prone to doing it way too often, with way too much enthusiasm. Here’s the problem with guilt by association: it’s not biblical. When John tells the believers to whom he’s writing not to welcome false teachers, he’s telling them not to allow itinerant teachers who don’t teach that Jesus was a real, corporeal human being to stay in their home. He’s not saying that anyone who understands a particular text or issue differently than I do is to be avoided. There are doctrinal disputes that call for separation: whether Jesus was a human being or whether or not he was actually raised from the dead would be one. Many of the disputes we actually do divide over would not be. Here’s the other thing about guilt by association: it was one of the things that the Pharisees had against Jesus. If sometimes religious people in his day misunderstood him and called him “friend of sinners” - well, I can only hope that sometimes I get misunderstood that way, too. I can tell you this - God being my helper, I hope never again, either publicly or privately, to allow guilt by association to color my opinion of a brother or sister in Christ. It’s too easily co-opted by other interests, too easily corrupted by our own self-righteousness, impatience, embarrassment, or hurt. I hope you’ll join me in repudiating the assumption of guilt by association, and that if the time ever comes you’ll hold your church accountable for it. And if you disagree - well, you’re still my sister or brother in Christ. I hope you feel that way about me.